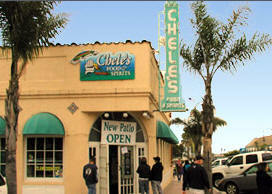 WELCOME TO CHELE'S AND TO BEAUTIFUL PISMO BEACH, ONE OF CALIFORNIA'S LAST, UNSPOILED BEACH COMMUNITIES. CHELE'S IS THE MOST AFFORDABLE FULL SERVICE RESTAURANT IN PISMO BEACH. THE RESTAURANT SERVES BREAKFAST DAILY FROM 8 AM TO 11:30 AM AND WE ARE FAMOUS FOR OUR EGGS BENEDICT, THE BEST YOU WILL EVER HAVE! AFTERNOON AND EVENING MEALS BEGIN AT 11 AM FEATURING OUR AWARD WINNING CHILI AND CHOWDER AND WE THINK, PISMO‚S BEST FISH n CHIPS. OUR FRESH CATCH, STEAKS, PASTA DISHES AND MUCH MORE WILL DELIGHT ANY DINER. AND, OF COURSE, YOU CAN FIND SANDWICHES, BURGERS, FABULOUS SALADS, AND MUCH MUCH MORE ON OUR MENU. TAKE A LOOK!!! OUR BAR IS PROUD TO SERVE "AWARD WINNING" BLOODY MARY'S AND TANTILZING BAR SPECIALTIES, DRAFT AND BOTTLED BEERS AND A WINE SELECTION FROM THE CENTRAL COAST. CHELE AND HER STAFF OPENED IN 1990 AND ARE PROUD OF OUR 15 YEARS IN THIS COMMUNITY. OUR GUEST'S, OLD AND YOUNG ALIKE, RETURN YEAR AFTER YEAR TO ENJOY OUR FRIENDLY,CASUAL, BEACH ATMOSPHERE AND AWARD WINNING MENU. THE BUILDING THAT IS OUR HOME HAS QUITE A HISTORY IN PISMO. BUILT IN 1926, IT ORIGINALLY HOUSED TWO MERCHANTS. THE PILLARS IN THE MIDDLE OF THE MAIN DINING ROOM WERE THE DEVIDING LINE. IN THE 30‚S BOTH SIDES BECAME THE FAMOUS "WALDORF CLUB", PISMO'S ORIGINAL NIGHT CLUB. THE LARGE NEON SIGN LOCATED ON THE BUILDING TODAY IS THE ORIGINAL SIGN. LOCALS AND TRAVELLERS ALIKE COULD FIND A COCKTAIL, POOL GAME OR DANCING ANY DAY OR NIGHT OF THE WEEK. ON THE POMEROY SIDE THE BAR RAN THE ENTIRE LENGTH OF THE BUILDING, MAKING IT THE LONGEST BAR IN THE COUNTY. PART OF THE ORIGINAL BAR REMAINS IN A DIFFERENT LOCATION. OUR KITCHEN CONTAINED THE BANDSTAND, AND DANCE FLOOR AND PATRONS COULD FIND THE RESTROOMS IN THE CHINESE RESTAURANT NEXT DOOR.THROUGH A COMMON DOOR. THE FAMOUS WALDORF PHONE BOOTH STOOD WHERE THE SMALL COFFEE STATION IS LOCATED NOW AS YOU ENTER THE BAR AREA. AS THE YEARS PASSED THE WALDORF CHANGED HANDS AND FINALLY IN THE 1980‚S NEW TENANTS WANTED TO PUT WINDOWS ALL AROUND THE BUILDING. WITH THE LANDLORDS PERMISSION THE WALLS CAME DOWN AND THE ORIGINAL WINDOWS WERE DISCOVERED UNDERNEATH. THE WINDOWS TODAY ARE THOSE ORIGINALS, ONLY THE FRONT DOORS ARE DIFFERENT. FOUND AT AN ESTATE SALE IN SANTA MONICA, THEY ARE FROM THE SAME ERA AS THE BUILDING. FROM 2001 TO 2004 CHELE'S HAS GONE UNDER QUITE A CHANGE. OUR OCEAN AND PIER VIEW PATIO IS ABLE TO ACCOMODATE LARGE GROUPS FOR PRIVATE PARTIES, REHEARSAL DINNERS, OR ANY OTHER FUNCTION. THE RESTROOMS, ONCE AGAIN ARE IN THE BUILDING NEXT DOOR ONLY NOW THAT BUILDING IS PART OF CHELE'S. IN DECEMBER OF EACH YEAR WE WILL CLOSE THE RESTAURANT FOR PRIVATE COMPANY CHRISTMAS PARTIES. PLEASE GIVE CHELE OR BLAKE A CALL FOR INFORMATION AND RESERVATIONS.